This article was posted by Annie on Dec 18 2014 on Hello Purple Clouds natural beauty blog. A good facial serum is a key part of my regular beauty routine, so when my usual brand ran out recently, I decided that it was time for a change and went hunting for a new serum to try out. 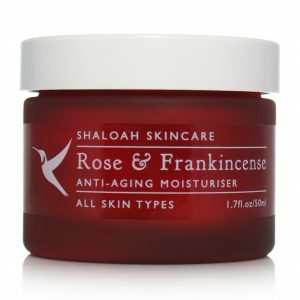 Through the magic of Twitter, I came across Shaloah Skincare, a natural brand with a range of handmade skin care products formulated from natural plant oils and extracts and pure essential oils. Each product’s ingredients are carefully chosen to address specific skin care concerns and there seems to be something for everyone. I chose the Olive Squalane Anti-wrinkle Serum as I thought it would fit well into my skin care routine. Squalane is one of the hottest ingredients in natural skin care at the moment. It’s one of those things that occurs naturally in our bodies but levels decline with age (doesn’t everything). Fortunately, it can be extracted from plant sources like the olive and when applied to the skin, penetrates rapidly to promote cell regeneration and reduce the signs of ageing. It also prevents UV damage, reduces blemishes and even at 100% concentration is non-irritant to skin – what a superhero! The serum is applied before moisturising and absorbs very easily without any oily residue. It is light and completely odourless – just a couple of drops is enough to cover all the problem areas on my face; chin, eye area and forehead. As well as olive squalane, the serum contains a blend of pure essential oils known for their rejuvenating properties, such as evening primrose, argan , rosehip and frankincense. It comes in a pretty green frosted glass bottle with a dropper applicator, so it’s hygienic to use and easy to dispense just the right amount. I have been using it for a few weeks now and am really pleased with the results. My skin tone looks much better than when I was using my previous serum, clearer and more even. More interestingly, a small scar on my chin, sustained from an over-enthusiastic kitten a couple of months ago, has completely disappeared since I have been using the serum. Overall, I think this is a great serum at a great price which has already become an essential part of my skin care regime. 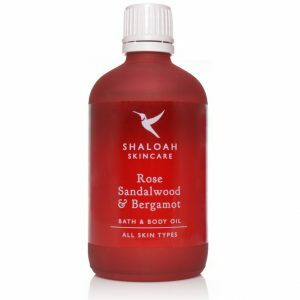 It is also worth mentioning that Shaloah donate 20p from every product sold to the Woodland Trust’s Plant A Tree campaign – I love it when companies give a little something back to the environment. 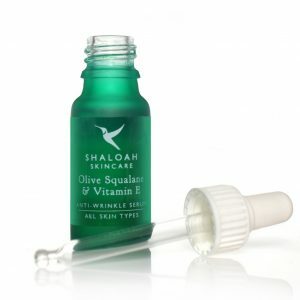 Ethical alert – Shaloah Skincare use olive squalane but many conventional and some so-called natural products use squalane extracted from shark liver. Please make sure the product you choose uses plant-based squalane. 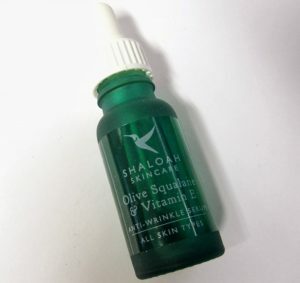 The Olive Squalane Anti-wrinkle Serum costs £12.95 for 15ml. Squalane (Olive), Oenothera Biennis (Evening primrose) oil, Argania Spinosa (Argan) Nut Oil, Rosa mosqueta (Rosehip) fruit oil, Tocopherol (Vitamin E) oil, Boswellia carterii (Frankincense) oil.